1 “I am honestly telling you, the one not entering the sheep pen by the gate but comes in some other way is a thief and a bandit. 2 The one who is entering by the gate is the shepherd of the sheep. 3 The gatekeeper opens it for him, and the sheep listen for his voice. He calls his own sheep by name and leads them out. 4 When he has brought all his own outside, he goes ahead of them. 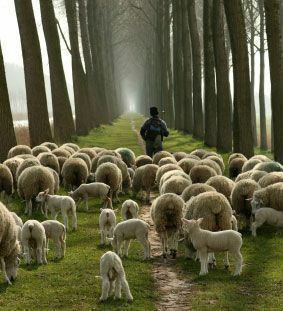 The sheep follow him because they recognize his voice. 6 Jesus gave them this illustration, but they did not understand what he was saying to them. John tells this story immediately after a story in which the supposed leaders of God’s people excommunicated a blind man because he dared to question their status before God. The blind man believed in Jesus as the Son of Man (read Messiah), and worshiped him. He had been healed by Jesus, and saw his healing as positive proof that Jesus was who he said he was. In that context, it is clear what Jesus means when he speaks of a true shepherd as one who enters by the gate. He was by the same illustration, condemning the false shepherds of his day, and endorsing those shepherds who would lead in his name. Later, Jesus will identify himself as the good (or proper) shepherd (10:11). But in this analogy, he is the gate. The proper shepherds are the ones who lead by first coming through the proper gate. I think the foundational application of this text is that all who dare to lead the church should have a genuine relationship with Christ themselves. LORD, before we dare to lead, show us how to genuinely follow you. This entry was posted in genuineness, Jesus Christ, leadership and tagged John 10. Bookmark the permalink.